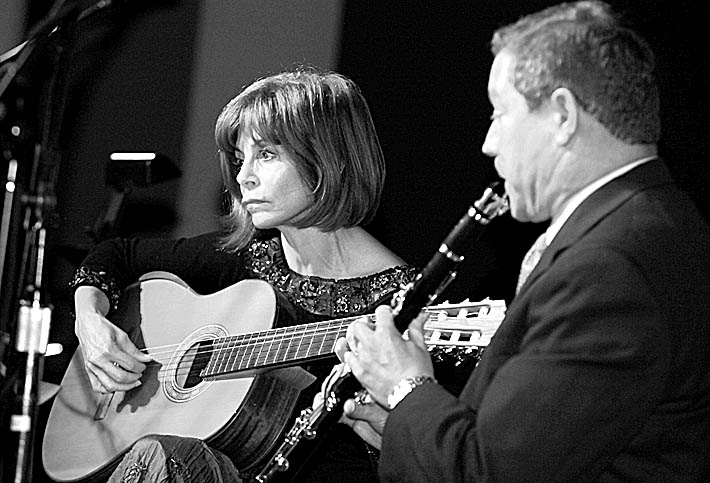 News file photo JoAnn Falletta, seen here playing guitar at Buffalo State College in 2012, performed with the Buffalo Chamber Players at the chapel in Buffalo Seminary on Wednesday. The Buffalo Chamber Players, joined by Buffalo Philharmonic Orchestra music director JoAnn Falletta, gave a recital on Wednesday with a twist. It focused on transcriptions and arrangements. With the exception of the soulful Adagietto from Mahler’s Fifth Symphony, and a dirgelike song by Willie Nelson called “I’m Falling In Love Again,” the music had a lighthearted feel. Such classic touches aside, it could be that the hall is becoming too small for this group. Wednesday’s concert sold out, and they were wedging people in so tightly that it challenged the claustrophobic. What if you had to get up? How would you get past your neighbors? Factor in the dead silence – both audience and musicians were solemn – and you had the ingredients for a Marx Brothers disaster. I don’t think the music on Wednesday’s program was conceived for such a setting. Most of it was airy and charming. A high point came with Tchaikovsky’s lyrical “Autumn Song,” arranged by Toru Takemitsu. Clarinetist Andrew Seigel performed the melody superbly, backed up beautifully by violist Janz Castelo and cellist Eva Herer in addition to violinists Andrea Cone and Amy Licata. It was rich and luxurious. The Adagietto from Mahler’s Fifth Symphony was another highlight. This was transcribed by Buffalo’s own Roland Martin. It featured violinists Cone and Shieh-Jian Tsai; Castelo; Feng Hew on cello; Daniel Pendley on bass; Falletta on guitar; and, most intriguingly, Martin on a huge harmonium that Castelo had found on Craigslist. An arrangement by locally based composer Caroline Mallonee of Schumann’s “Im wunderschoenen Monat Mai” was also lovely. Woodwinds popped out at you gently, like bubbles, following Schumann’s harmonies closely. James Wright is a fine singer and did justice to the yearning melody. The Schumann was followed by a song Mallonee had written, an aria by Renaissance composer Carlo Gesualdo and that dirge by Willie Nelson. Strange bedfellows, but Mallonee’s approach was similar throughout. A giggle had gone through the crowd when Castelo, with his usual humor, introduced the Willie Nelson. But Wright was so grave that it sounded kind of like a spiritual. Throughout the night I frequently thought the atmosphere rather too serious for what we were hearing. Schoenberg wrote his transcription of Johann Strauss’ “Kaiser Walzer” (the famous “Emperor Waltz”) for his students to play at a party, Castelo explained. Clearly Schoenberg meant it to be fun. He threw in a few surprises, one being Haydn’s “Kaiser hymn,” worked in near the end. (The world knows it better as “Deutschland Uber Alles.”) The instrumentation was clever and colorful, like cafe music. But Wednesday’s performance never achieved the right Viennese lilt. Licata showed flair for the top line, but the piece, anchored by pianist Susan Schuman, stayed earthbound and labored. The night ended with a transcription of a five-movement Notturno by the now-forgotten Wenzel Thomas Matiegka, begun by Franz Schubert and finished by Falletta. This wasn’t great music, but it was well constructed, like a masterfully built house. There was a fine little Gypsy movement – appropriate considering that throughout the piece, the guitar often played Gypsyish grace notes. The plaintive slow movement showed the mellow tone of Feng Hew’s cello. The concluding Theme and Variations spotlighted the instruments in turn. Falletta seemed to enjoy her moment in the spotlight, which was particularly fun to hear. Wednesday evening in chapel at Buffalo Seminary.